I just love that yellow and green combo. Classic! I can’t even imagine all the work that went into restoring this woodwork and making it gleam! Sharon says, “Jeff loves his BlueStar Range!” She loves her soapstone counters and sink. Craftsman Design & Renovation worked on the remodel and took some of these photos of the house. They did an amazing job. Many thanks to Sharon and Jeff for showing us around. For more before & after photos and information about their reno, visit their blog Laurelhurst 1912 Craftsman. wow! That’s amazing! They must have worked their little hands raw getting all that paint off the woodwork! But what a stunning result! The living room is ok, but the rest of the house just has way too much of that particular brown wood for my taste. Everything blends into a milk chocolate blur with nothing standing out. I’m in awe of the amount of time it took to strip all that woodwork, but I think the wall paint colors pop sooooo much better against white trim. All that brown is so dreary and sad looking. Wow. That is amazing. I can’t even bear to THINK about all the work that went into stripping that paint – especially on the ceiling. Yikes! While Craftsman is not my own personal style – I do appreciate and love looking at it when it’s done right – and they did a beautiful job. The new kitchen blends perfectly with the period while still being modern. I love how they restored this house. 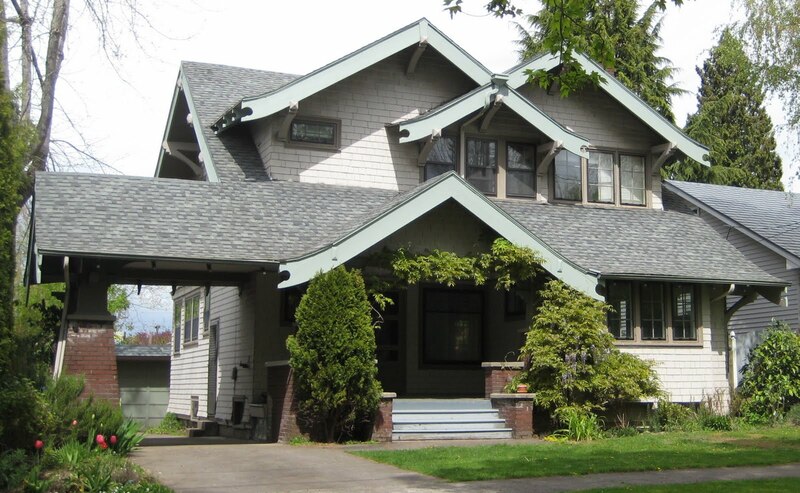 This is what a Craftsman house is supposed to look like. White trim looks great in some houses, but in a Craftsman it’s criminal. I can understand that some people don’t want all that beautiful gleaming wood, but to put a paintbrush to it is just…well, the house should haunt people that do that. Their keys should go missing and their pipes should burst. I’m from the Northwest and to me this house looks warm and cozy and inviting and a great place to read a book on a rainy day while baking some cookies in that perfect green stove. I raise my locally brewed beer in a toast to Sharon and Jeff and the folks at Craftsman Design & Renovation for taking such great care of this wonderful old home. Loved your comment. You said it so well! Here here! I wish this comment had a “like” button. AMEN!!! The loving dedication shown in Sharon and Jeff’s faithful restoration is awe-inspiring! Now, for everyone who is even THINKING about remodeling a Craftsman/Arts and Crafts Bungalow, in any location, and in any way whatsoever, this should be REQUIRED reading! Before even picking up a paint sample card at the store – this is how it SHOULD be done. Hooray for the way this was done, and kudos to the wonderful people who had the foresight to treat this home the way it was meant to be treated. For those of you who are not fans of the beautiful gleaming woodwork and the way this home was painted, then please feel free to make other forms of architecture your homes. But, please do not “remuddle” something this terrific into something totally unrelated to the way these homes were meant to be. They can be lovingly maintained, as this one surely will be, without making them into completely foreign styles from their original purpose. I used to think it was criminal to paint over wood trim, but now I feel there is no right or wrong about it. It is about personal style and what you are comfortable with. I live in a Victorian brownstone with lots of wood trim, but I painted it because so much natural wood makes a house too dark for my comfort. I know that I would not have stripped the wood in this house but it still looks fabulous and the home owners did a great job. Stripping all that woodwork takes nerve. I thank them so much for sharing these photos with us. They have a truly beautiful home. I love the craftsman style. Love Craftsman. They did a beautiful job. Anyone who has ever stripped woodwork can really appreciate how labor intensive this was. Fabulous “after” shots! Having stripped a lot of woodwork myself, I think the “after” really hits it out of the park. The “before” is generic and dullsville, IMHO. The inside of this house is absolutely perfectly gorgeous! Thank you for sharing. I hope the outside looks better in real life. The choice of the yellow stain looks really bad with the color of the brick on my computer. Really? I love the yellow and green. The yellow is a little mustard-y for my taste, but I think when they’re done with landscaping it won’t stick out so much. I LOVE what they did with this house but why did they do nothing with the landscaping in front of the house? It truly won’t be “finished” until then. The grass and shrubs look really bad and don’t do justice to what they did with the house. The house is still a work in progress. You can follow along with it on their blog as they continue to work on it. As we all know, a house is never completely finished! This is so true…but in this case the front yard looks totally unkempt – the grass is brown, the shrubs aren’t trimmed at all. Maybe it’s how they do things in that part of the country. Here in Michigan lots of people take pride in their “curb appeal.” Even with our dry summer lots of lawns look lush and green. This house has no curb appeal at all and the way the outside looks would not make me want to go inside – I sure hope they do something with the outside. The front yard looks nothing like this anymore. The After picture shown here was taken shortly after the house had been re-sided and painted. Do you know what that process does to yards? Totally trashes them…. It wasn’t even worth watering the sad lawn we had out there. The front yard is now filled with pretty growing plants. No lawn at all. That’s wonderful to know, because the house is so beautiful!!! I’m happy to hear this. True to the house they are doing an incredible job! Looks beautiful! What a labor of love! All that woodwork is so beautiful and really takes center stage now. I haven’t gone to read their blog, but I’m wondering about the windows on the right on the second floor. It looks like they removed a row of three in favor of one tiny window. From the outside, I prefer how the “before” looks in this regard, but maybe for the interior it makes sense for them to have made this change. We converted a sleeping porch into a walk-in closet attached to the master bedroom. The sleeping porch was quite pretty–but wasn’t useful for our purposes as it wasn’t necessary anymore with central heating/cooling. We needed storage far more than we needed an enclosed sunny porch. I love white trim, but that trim is just beautiful and goes with the style of the house much better than the white. Also like the kitchen, looks very easy to cook in. Seeing some of the mamoth kitchens that are so popular, I wonder how people don’t become exhausted tramping a half mile from the stove to the fridge…plus, how do you remember where everything is at? 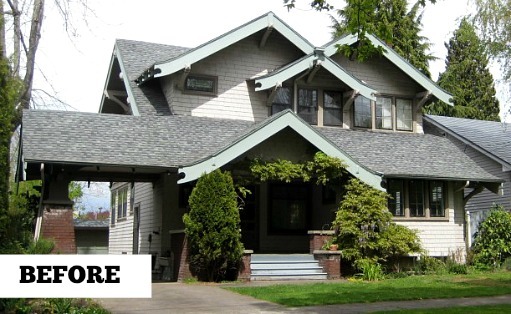 I love craftsman homes and I think it looks beautiful. However, I probably would not have stripped the paint in every room, just because it is so dark. I sort of preferred the dining room with the white trim and in the master bedroom. But, it’s about personal style and overall, I think it looks great. I think the end result is fantastic and I thank the owners for being great stewards of this house. All of their choices are spot-on.The house looks to me like it is smiling now. Extra bonus points for their kitchen restoration. The kitchen really flows with and looks perfect with the rest of the house. 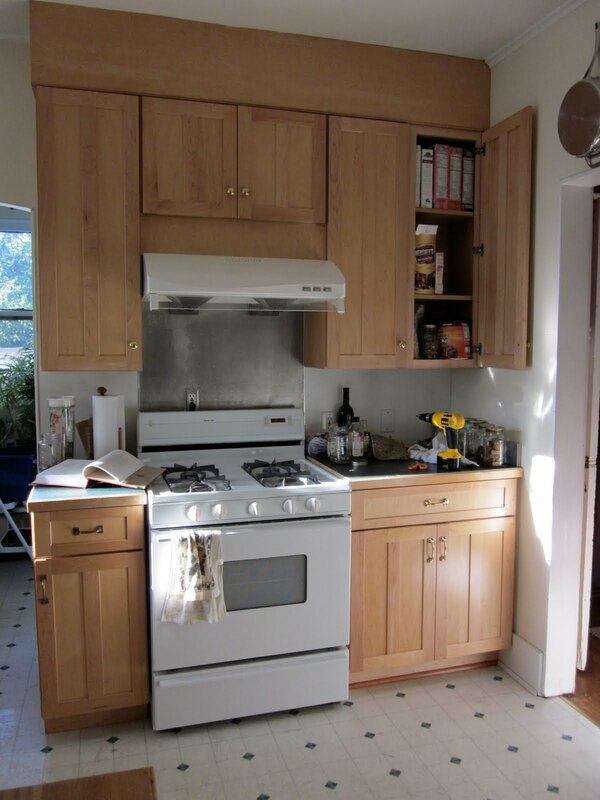 We’ve looked a a lot of old houses and I’ve seen a lot of kitchens that you walk into and it’s just jarring because the look is so different from the rest of the house. Not so here! I love the house. I think the trim looks lovely and goes perfectly with the house. I would think that restoring the house to how it looked previously would also increase the value. Looks like a lot of dusting though! I could move right in today!!!! Lovely house and so glad to see that woodwork restored! A couple of the rooms remind me of the great old bungalow featured as the Stedman house in the ’90’s drama Thirtysomething. I always wondered where that house was & if the interior shots were real or just sets. That is BEAUTIFUL!!!! Wow! I thought the same thing when I saw the woodwork…ALL of the time and work that went into that! Amazing! Just a fantastic job. 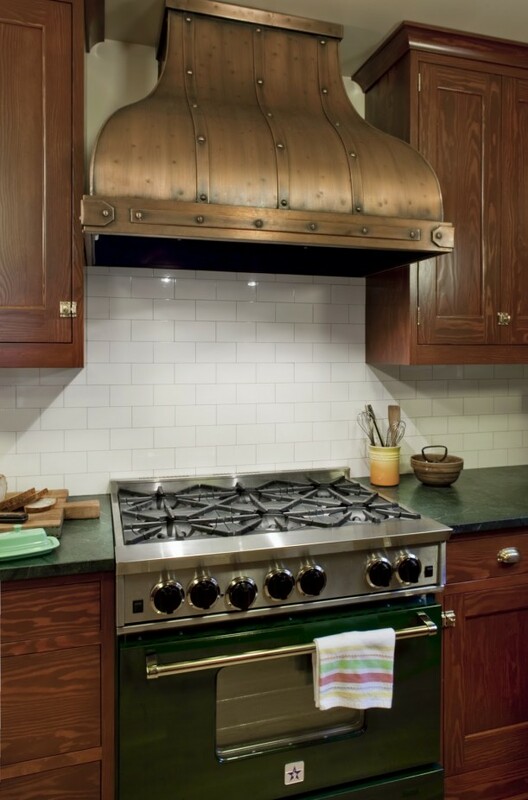 I love the range hood in the kitchen! Wow. What a fantastic job restoring all that woodwork. Kudos to them. Personally, I think it’s criminal when true Craftsman trim work is painted white. 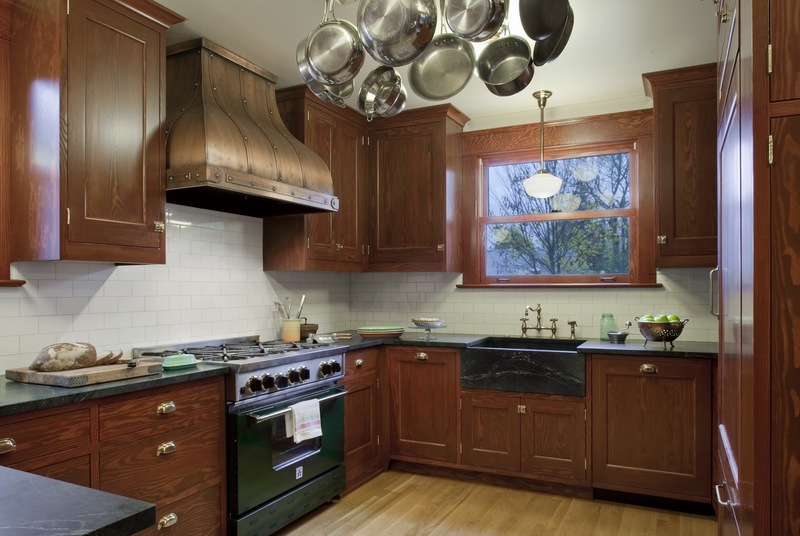 The beauty of the wood material itself is intrinsic to the Craftsman style. Yes, it is dark, but that translates to warm and cozy, and also to a more natural, organic feel. 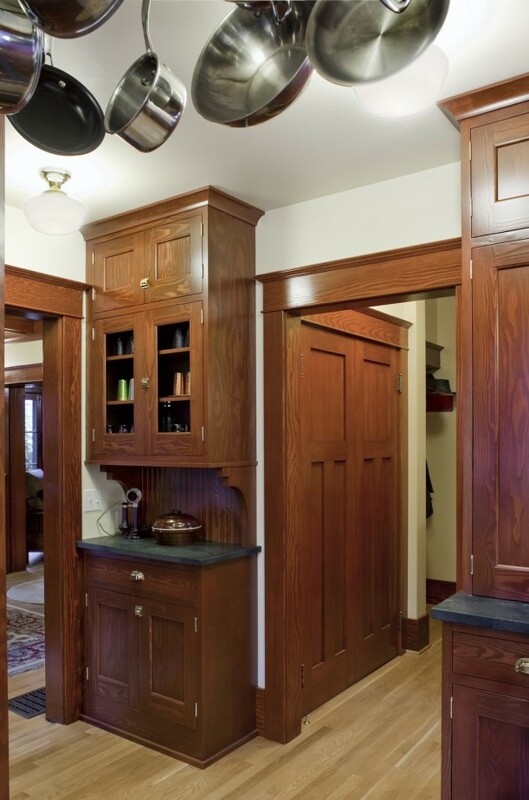 If you don’t like dark woodwork, don’t buy an original Craftsman! I realize that white interiors can be charming and shabby chic, but please don’t do that to an historical home. 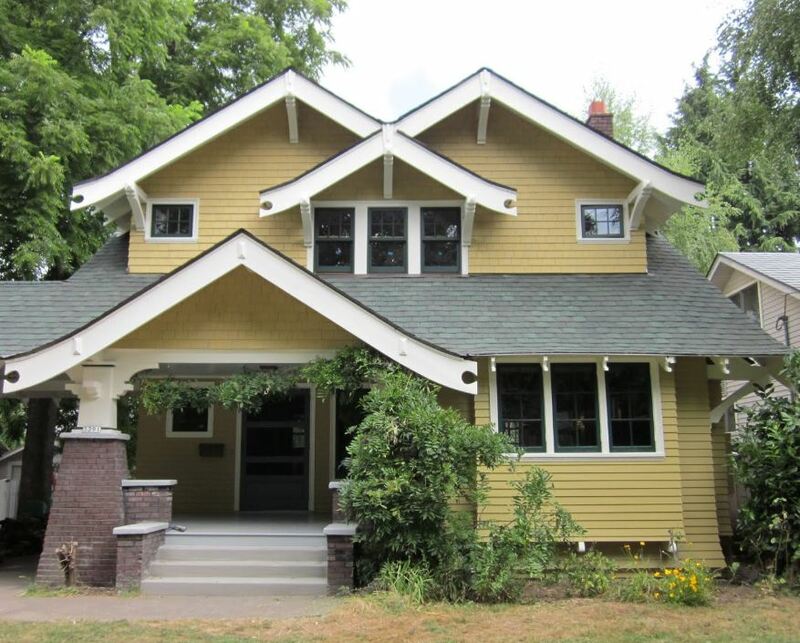 I think the owners have done a beautiful job of restoring authenic Craftsman style to this gorgeous house. I could faint dead away at the thought of stripping and refinishing all that wood, but wow, was it ever worth it! I admit that I love the look of wall colors against white-painted wood in a very traditional house. But that doesn’t work in every style of house. And this wood is gorgeous. Good work! Oh WOW! I love, love the Craftsman style. Pre-shorehouse, we rented a little Craftsman cottage in town and I spent the summer imagining stripping the woodword (even the floor was painted white)…and it didn’t have half the detail this place does! I totally appreciate that the owners did a historically accurate reno of the house — it takes a special person(s) for sure. I’m Hooked on Historial Houses, so I love it! Wow, that is amazing. I love how restoring the original wood added so much character. What an amazing renovation, and an amazing labor of love! I hand-scraped one room’s worth of wallpaper years ago and my hand cramped into a claw for months afterward. I can’t imagine the amount of labor that went into restoring all that woodwork to its original form! 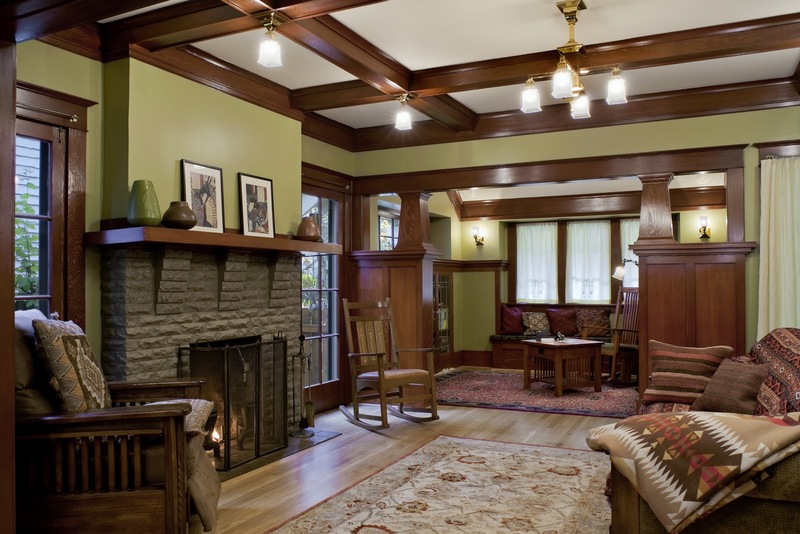 While the Craftsman style is not for everyone (some have mentioned it being “too dark”), I can imagine in rainy Oregon these rooms feel perfectly warm, inviting and cozy. If I curled up with a book in that window seat, I don’t think I would ever leave that beautiful little sitting area off the living room! This is exactly how a Craftsman home is supposed to look! You are right, Julia, that woodwork positively gleams, and it feels like the house is smiling! one question, did they actually put a new green roof on the house?? the other one looked in good shape, or maybe it wasn’t..?? i cant imagine being able to afford a new roof just for color purposes! WOW! it looks fabulous though!!! What an amazing job! I absolutely love everything that was done to this house. You bought a Bluestar too. I just sold my house. I miss my Bluestar, if one can miss a range, but I do. I love the green that was chosen. That yellow on the outside is perfect. Great job. Thank goodness you’ve restored it! What a beautiful restoration! The wood is so warm and homey. Love the happy yellow exterior. I’m amazed at how they were able to strip off all that paint – how did they do that? Gorgeous! I love the stained wood, though sometimes I feel like it makes everything blend together; the wood furniture, the wood floors, neutral wall colors. I like a bit of a combination of painted trim and stained wood…the painted trim helps the stained sections just pop out beautifully. Wow! That is a lot of work they put in that house – and it shows! I cannot imagine the hours that went into stripping all that paint to discover the beauty beneath….just stunning! Really, it’s hard to realise the huge work of restorating specially the woden one…it revealed the love for this house! Even with all the (gorgeous) dark wood in the house, I was so excited to see that it felt so light in the house. Especially the living room, it looks so great in there. I love the gray fireplace and love the mudroom off the kitchen. Thank you to Sharon for sharing! Oh my! I can’t believe how much stripping they did! It’s beautiful. 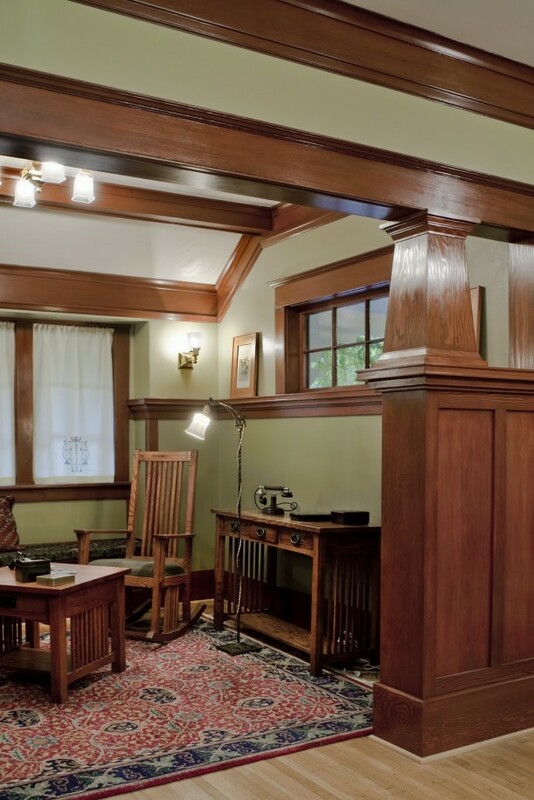 When I stripped the paint off of the woodwork in just one room in our 1915 craftsman bungalow, it took me about 300 hours and I thought I was going to lose my mind. Kudos for a fabulous job! I can answer your question. As my husband worked on Thirtysomething. It was a set and when they shot exterior shots of the home, it was a fake house on a street that the lot has. Once you open the front door to those houses, most of the time there is nothing. Barely a room. Sometimes though there are offices. I’ve sat on the porch a couple of times! But that” house” is gone now. I absolutely love this house!!!! They have given it new life. I could move in a minute! Sorry to squash the dream! I have loved so many set’s and wished that my home looked just like it. This one is a gem, they are lucky to live there. So interesting! Thanks for the behind-the-scenes scoop, Lynn. I loved that show (and their house)! You are very welcome. It is kind of a bummer having a husband that works in the Industry because i can look at a street someone is driving/walking down on a tv show and i know what lot they are at! LOL I recognize the houses. I kind of miss not knowing how tv shows are put together. 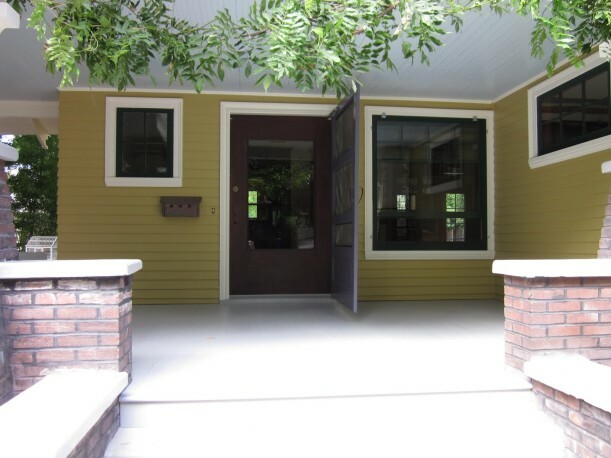 I applaud the effort, we too have been working on a 1969 Mid-Century Modern home, and our project began in 2008. I think the exterior change in this house is spectacular and the architectural details are strong and quite nice. The home clearly has it’s own unique charm….good work! It’s understandable how some people can’t live in some of these dark wood spaces so end up painting over this type of wood work. However, here the owners have done just a magnificent job on the interior. While it may be a bit dark for some, the lighter floors help keep it from being overwhelming. The one thing I’d change though, is the greenish mustardy exterior color. It’s an odd choice for a craftsman and makes the brickwork look sallow/muddy. Really not a fan. Long story short, I’d change that in a hot minute. oh that is gorgeous! a real appreciation for natural wood. looks so much more stately in dark brown. i imagine it’s what the thirtysomething house would have ever looked like if they had ever finally finished that labor of love. Absolutely beautiful! I’m stunned that some readers don’t appreciate that woodwork. Even if a Craftsman-style home isn’t your thing, if you are reading a house blog, you should understand that stained woodwork is a hallmark of that particular design. 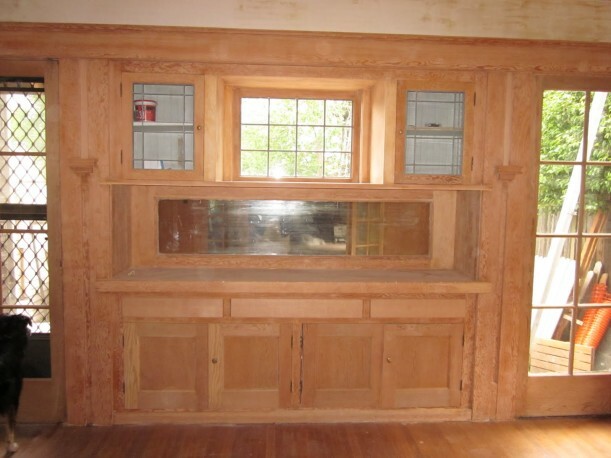 Walk into a Home Depot, people…you CANNOT find millwork like that anymore in your average lumber yard. I know someone who lives in an older home filled with hefty quarter sawn oak trim, and his insurance company will NOT provide replacement cost coverage on it. It kills me to see people paint over something that is becoming so rare, whether it be furniture or trim. 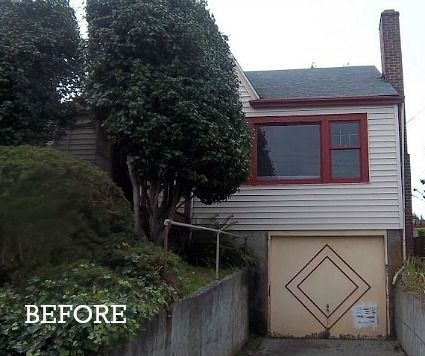 Bravo to these homeowner for restoring their home! I absolutely love this before and after. It is clear that the owners are dedicated, passionate and that they were thoughtful with their decisions. Congratulations to them on a beautiful job, well done. I hope they live very happily there for a very long time. I agree that if you don’t like natural wood, you shouldn’t buy a craftsman house! They did a great job restoring this beauty. I probably would have added more color in the furnishings and maybe some of those great Arts&Crafts wallpaper borders over the wood. 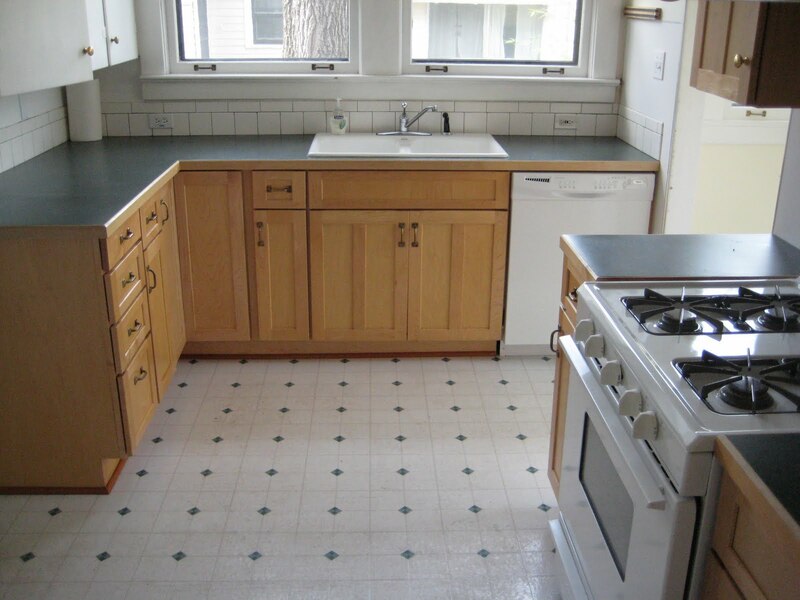 Also, since the kitchen was a re-do, I’d have put in painted cabinets with maybe a nice yellow or green (or both) instead of more dark wood. Love the stove and hood. Wow! I think this is my favorite post yet…. Absolutely gorgeous! Now that is a real restoration! I can’t even begin to imagine the work that had to go into this house. It gorgeous! So pretty! I’m glad they left the vine growing across the steps. The more vines and greenery, the better in my book. ..
Love to see people who have respect for the history and integrity of older homes. This one is lovely. So many business and residential structures are plowed down with no thought of trying to save it. Once it’s gone, it’s gone. YES!!!! Craftsman done right! I really dislike the white painted woodwork in a A&C house – it looks so institutional (except in kitchens and bathrooms, sometimes in kid’s bedrooms). I guess I’m just a purist at heart, and I’m SO glad the prior owners of my tiny bungalow never painted. Kudos to the owners for all the work to restore that lovely house. Good stuff. Best part in this house is its living room. i quite like the wood work. it gives very contemprary look!! I liked the kitchen much better BEFORE. NOW it’s way too dark for the 360 cloudy days in the Pacific Northwest. I would have left the woodwork white and painted the walls a warm pretty color to accentuate the white trim. But different strokes for different folks, right? 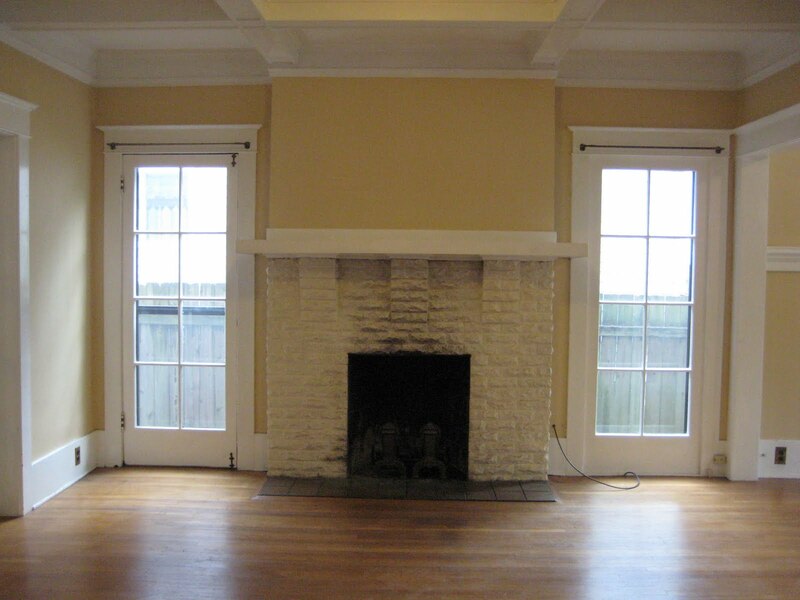 What color is that Green in the living room with the fireplace? The living room was painted with Sherwin William’s Ruskin Room Green. And yes, we did put on a new shingle roof. The house had recently been roofed before we bought the house, but they hadn’t properly installed the underlayment and the shingles so we re-roofed it again. We were not thrilled with the expense, but we wanted to protect our investment. And we were happy to have the opportunity to change the color. We do have a lot more plans for finishing the rooms, but we’re slowly working our way through the house doing the basics first. We will be either papering or stenciling the friezes, eventually. I really appreciate so many nice comments. I’ll ignore the rest…. This house is fabulous, all of that beautiful woodwork is just wonderful and really brings it back to its origins. My only complaint is the light hardwoods, they just don’t match. This is a reminder of why a craftsman is my favorite home style! And amazing work on the house. Can you imagine if everyone would do even half that much work to improve their property? PS—-green and yellow? Perhaps they’re U of O Duck fans? Absolutely gorgeous transformation. 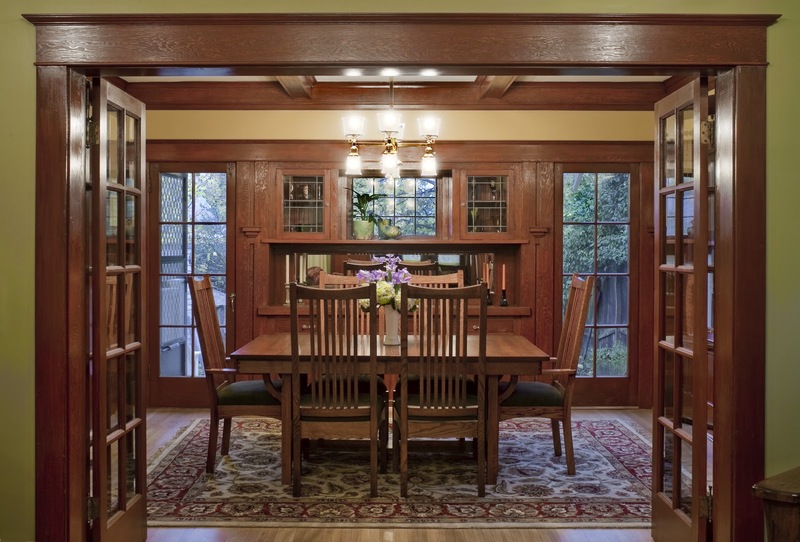 What they did with the woodwork and interior reminds so much of why I love Craftsman homes. Just a d o p t me. Please. I would die for a house like that. Okay, maybe not die but you know what I mean. Sadly, my husband hates anything to do with labor and would probably divorce me after sanding for one week. Most likely my favorite house yet. Utterly perfect. Bravo to all involved. The woodwork also caught my eye. I have a colonial style home with ceiling beams like the one’s shown in my house. In my case, the white color matches the style of the house, although the beams are too simple for my taste. I’m planning on adding some crown molding to give it some character. I may not have gasped when I saw the living room, but my heart did a flip flop. I love the whole house, wouldn’t change a thing! Individuals. Read about Frank Lloyd Wright. Millwork. Arts and Crafts style. Mission style. Salute. Honestly, all the best and well done. applaud your work with out my own willful bias. So. Darn. Beautiful. Ahhhhhh. That wood work. Just looking at the front of the house, I liked the white as an exterior colour a little more. After viewing the other pictures of the exterior, I definitely like the yellow much more. That kitchen was something else. It doesn’t fit the house at all. I’m not sure I can express just how much I love that kitchen! WOW! 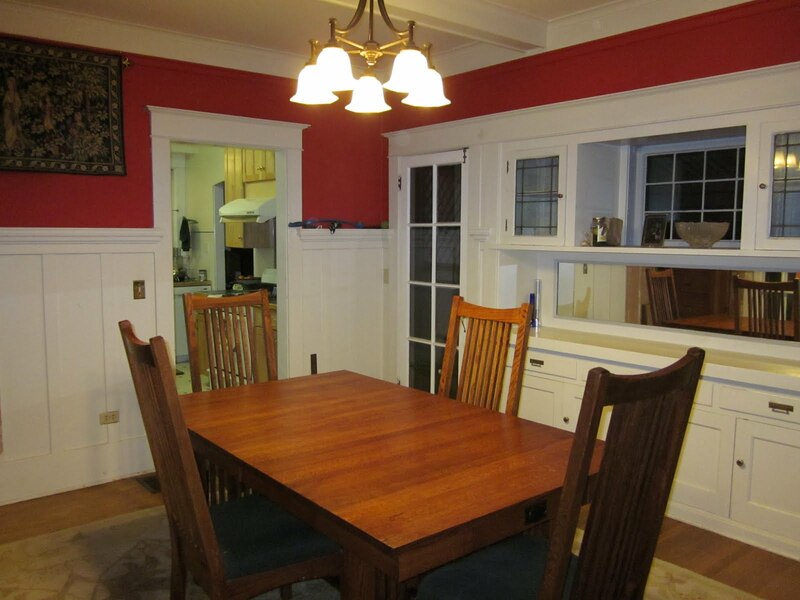 I dislike the red originally used in the dining room, but I do prefer the white over the wood. They yellow living room was nice but the after version is absolutely stunning! I think this house is absolutely beautiful for someone who really loves wood used throughout. The color in the before photo may look white, but the exterior of the house was sort of a brownish gray, with a light green on the trim. It wasn’t a bad color, but we had to repaint anyway so we chose a period combo from a house kit catalog photo. I know this is off topic but I would love it if you did a blog post, perhaps with reader input, of home prices in their areas. I go to open houses regularly and am shocked at the prices…even in this economy! We live in an area where the average home increases 5% a year and I can’t believe how little home you get for the money now. And this is in a largish city in the Midwest but not Chicago or a higher priced area. It would be interesting to know how prices vary across the country in a recession. I am so in love with the restoration! 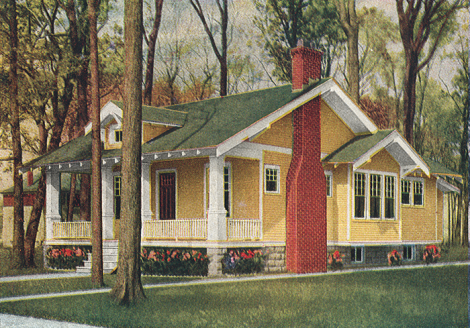 Craftman style is my favorite of any home architecture. The fact they brought back the elegance of all the woodwork..beautiful. Having grown up most of my life in the North, tho I am Texas born and have been back in Texas a long time, one thing I truly miss on the homes here.. Front Porches!! I know Georgia, Alabama & lots of southern states have the verandah style, but Texas.. not so much. So this home fits me to a tee!!! Just a second comment..NOW do some landscaping!! Such a beautiful home, NEEDS a beautiful landscap!! Becky–see her comment above. The landscaping has already been fixed. I just didn’t have a photo of it. Wow, love that house. I personally prefer the dark wood in an original craftsman but I think white can look nice as well. I don’t mind darker and moodier interior spaces. It’s definitely a personal preference.. I appreciate all the hard work that they put into their home but the “after” is way uglier than the “before”…it makes the house look dark and dreary and ancient. Looks as if the owners must be 90+ years old.